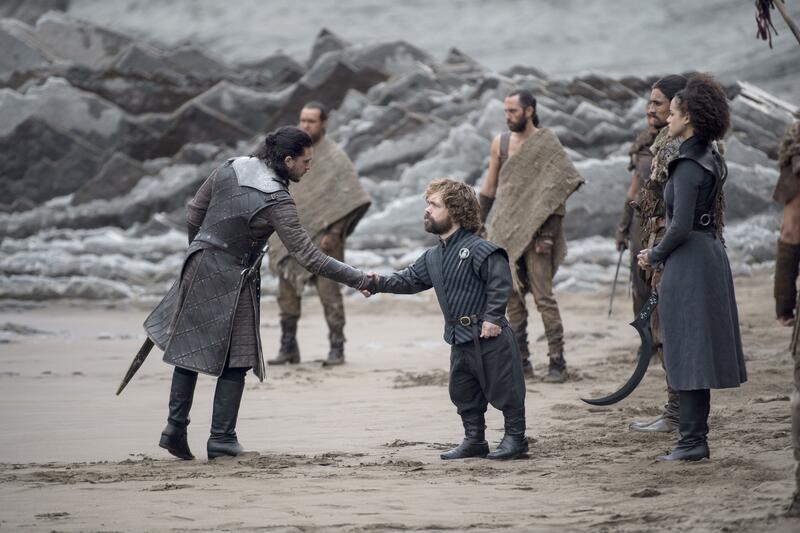 “Game of Thrones” airs at 9 p.m. Sundays on HBO. Kit Harington’s “Saturday Night Live” hosting debut last week included a monologue heavy on “Game of Thrones” with one primary through-line: Harington, who plays Jon Snow, refused to reveal how the show ends. It didn’t matter who was asking him, be it co-stars Emilia Clarke (she forgot) and John Bradley (HBO wouldn’t show him a full script) or his wife and former co-star Rose Leslie (who doesn’t actually care how it ends – she just wants to know what they’ll do for money). These bits were riffing on HBO’s ironclad battle against spoilers for its most popular enterprise. While this fight has often bordered on the absurd, it’s difficult to deny that the show has been about as leakproof as the Mueller investigation. That’s only the tip of the iceberg of HBO’s deception tactics, however. Turner added that anyone visiting a set “had stickers on their phones so that they couldn’t take photos,” and actors and characters had code names on call sheets “so that no one knew who was really going to be on set.” The season was also filmed under the fake title “Face of Angels,” she said. Perhaps the most outlandish steps taken to keeping the show’s plot a secret came during the filming of Season 7 when the showrunners reportedly did actually create some decoy scenes (though they probably didn’t film them). Much of the cast feels similarly. Their caution is not unfounded. Four men were arrested in India after allegedly leaking an episode of the show and demanding a ransom of about $6 million in bitcoin to prevent them from releasing others. Published: April 10, 2019, 3:52 p.m. Updated: April 10, 2019, 3:55 p.m.